Berakah Arts and Richmond Adult Community College are delighted to announce a night of music and comedy in the lovely purpose built theatre at Richmond Community College, celebrating the end of summer term for The Sing For Peace Choir, a community of people from different faiths and heritage coming together to raise their voices in support of Peace, Unity and The Common Good. The evening will be hosted by comedy and musical legend EARL OKIN who will regale us with his wit,wisdom and songs plus music from Sing for Peace and the youth band Increase The Peace, both community projects facilitated by Berakah Arts. It promises to be a hilarious and heartwarming evening so come along and support your community. 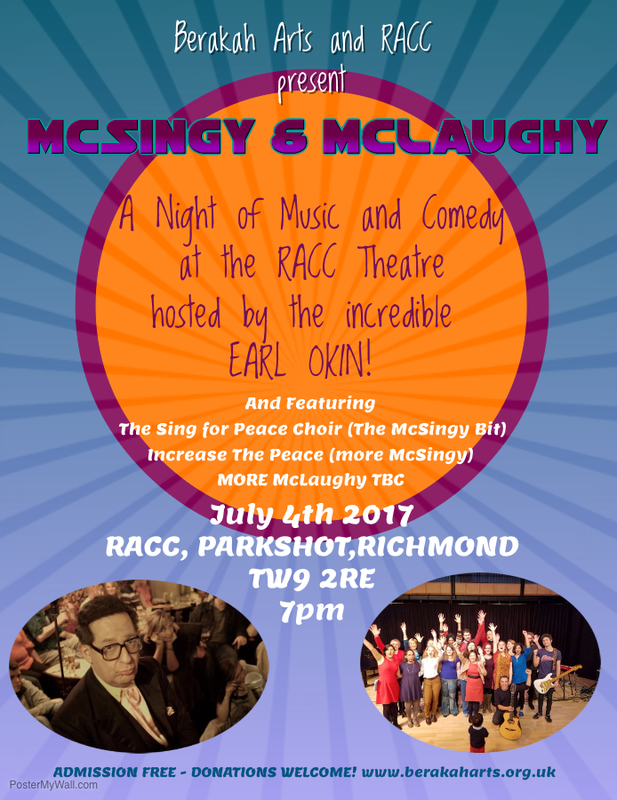 In partnership with RACC, the home of the Sing For Peace Choir.